So, back to that moment of wishing my week away. I don't really want to do that. But I do with the weekend went a bit slower. My mom, sister, soon-to-be brother-in-law, brother and niece came to visit. 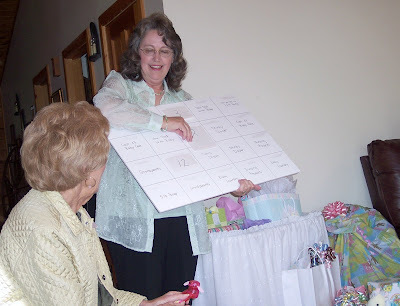 I wanted the women (including 3 1/2-year-old Milla) to come to the shower that my mother-in-law and sister-in-law planned. 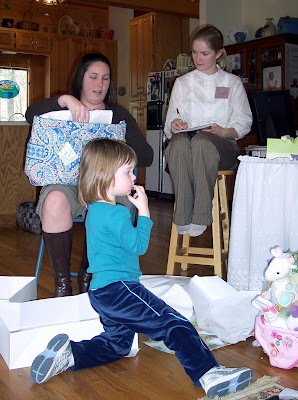 Plus it was Easter, and I thought it would be fun to vary the Hill family gathering location. And then everyone had to make a baby out of Play-Doh, and I judged the masterpieces. 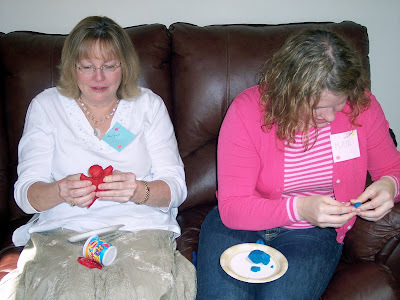 (Above) That's Greg's aunt Jennifer and her daughter Maya working hard on their Play-Doh sculpture. 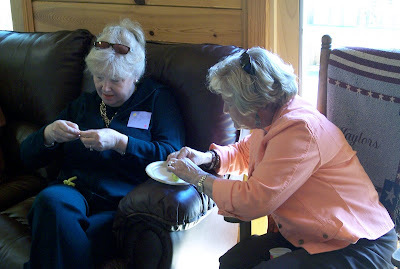 But I picked the one Greg's great aunts, Mary and Beverly (shown below), made as the winner. They may have had a funny colored baby, but, hey, it had a belly button, which is more than I could say for anyone else's. Milla helped me open presents. Here I'm in awe of the beautiful diaper bag Mom and Cassie gave me. I love it. Makes me want to tote all sorts of necessities (and goodies) around. 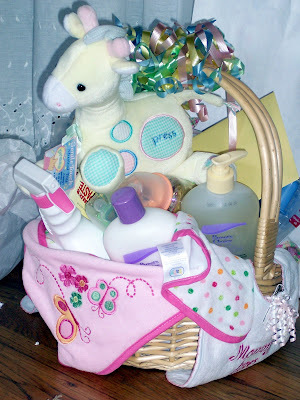 My other favorite gift was this basket of necessities (which, again, translate into goodies for me). That stuffed horse plays a calming lullaby, by the way. And Milla wasn't the only cute baby girl there. 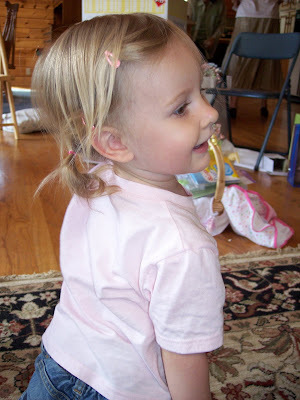 Here's Ethne, plus there were three other toddlers. They all chattered in their own way, but none of them paid much attention to any of the others. MEANWHILE, DYING EASTER EGGS IS SERIOUS WORK, I TELL YOU. Cassie is concentrating on making sure the tablets are fully dissolved. 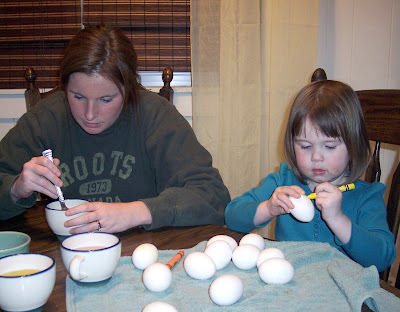 While Milla is taking Zac's advice to use the crayon to add more design to the egg before dipping it into a color. And then after we (sort of) convinced Milla that the stickers would work best if she waited until the following morning when the eggs were dried, she went on to sleep. But she didn't forget. 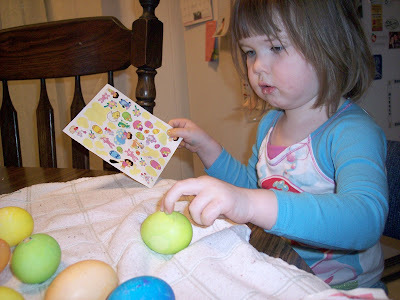 The stickers were the first thing on her mind Easter morning. Seriously, who could forget Dora?